North and South Korea agreed on Wednesday to march their athletes together under one flag at the opening ceremony of the Winter Olympics next month and to field a joint women’s ice hockey team, as the New York Times' Choe Sang-Hun reports. Dive Deeper: See “The Winter Olympics and the Paradox of South Korea’s Global Reach and Its Regional Constraint,” by CFR’s Scott Snyder. The Pentagon’s first new national defense strategy in four years will adopt a more aggressive military stance against China and Russia as its top priority, according to people familiar with the document, as the Financial Times’ Katrina Manson reports. Dive Deeper: CSIS International Security Program experts today briefed the press with their observations about the National Defense Strategy. Saudi Arabia said today it would inject $2 billion into Yemen’s central bank to stabilize the nation’s currency, as international criticism grew over the kingdom’s role in a war that has killed thousands and ravaged the economy, as the Wall Street Journal ’s Asa Fitch and Saleh al-Batati report. Dive Deeper: “More Than a Thousand Days of War in Yemen,” by Alan Taylor for the Atlantic. CSIS & Syracuse University's Maxwell School of Citizenship and Public Affairs offer Executive Master's in International Relations. Information here. 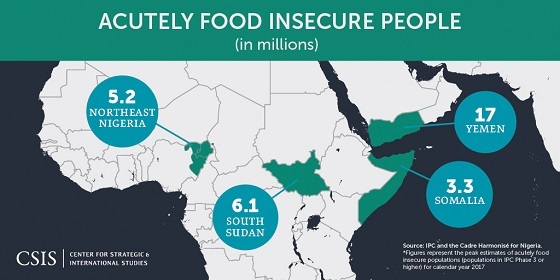 The war in Yemen has killed or injured more than 5,000 children and left another 400,000 severely malnourished and fighting for their lives. — Sen. Lindsey Graham (R-SC). (Photo credit: Lluis Gene/AFP/Getty Images.) 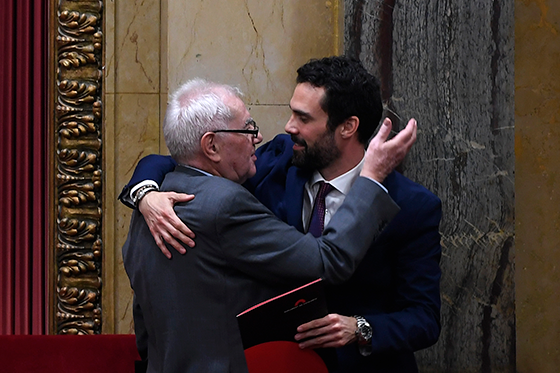 Newly elected parliament speaker Roger Torrent (R) is congratulated by member of the European Parliament Ernest Maragall during Catalan's parliament inaugural session today. “Saying Goodbye to One of the Best Men in Washington: Shawn Brimley was of a special breed,” by New America’s Robert Bateman for Esquire. At 8:45 a.m., CSIS will host House Speaker Paul Ryan for a conversation on U.S. national security challenges. You can watch it live here. At 10:00 a.m., join CSIS for a conference featuring Robert Lightfoot, NASA Acting Administrator, on the Trump Administration's civil and commercial space priorities. Join the CSIS Energy and National Security Program at 2:00 p.m. for a discussion with Masakazu Toyoda, Chairman and CEO of the Institute of Energy Economics, Japan (IEEJ) and a presentation of the IEEJ’s Energy Outlook 2018. “How it Works: Midcourse Discrimination” from the CSIS Missile Defense Project explains how to intercept a long-range ballistic missile, step-by-step. The latest episode of Russian Roulette explores what inequality looks like in Russia, and what it means to be wealthy and poor in its various regions. Available on SoundCloud and Apple Podcasts. A funny thing happened during my Soul Cycle class the other day. The class instructor is a twenty-something and in the middle of the session announced that she felt like playing a Talking Heads song. This was remarkable because normally, Soul Cycle playlists are rooted in the present and don’t include such antiquated sounds. But it really made me smile when the Heads’ “Once in a Lifetime” filled Soul Cycle with sonic bliss. This version of the song she played came from the 1980 studio album “Remain in Light.” It’s excellent, but the live version from the 1984 film “Stop Making Sense” is even better in my book. I asked my Soul Cycle instructor if she had ever seen “Stop Making Sense.” She hadn’t, but like any good millennial promised to dial it up on Netflix ASAP. Can you imagine her surprise when she witnessed this spectacle?